What better way to learn to teach playwriting and AP Language than to have a best-selling playwright and award-winning classroom teacher come to your own school? Bryan is available for half-day and full-day consulting. Now that you've bought one of Bryan's plays, you can hire the playwright to help guide you through your production! Bryan will be available to you every step of the way from auditions to the curtain call, advising you on blocking, sets, costumes, props, special effects, lighting, music, publicity, ticket sales and more. Bryan has directed over 40 shows in the past 12 years and he has produced every play that he has written. Hire him today so that he can help you make the most of your Bryan Starchman production. Rates start at $500 and include one-on-one guidance, phone conferences, same day e-mail responses, and Skype conferences for up to 8 weeks of your production. Aimed at working with students to teach them how to write their own original stories, plays, and screenplays. An entertaining, energy-packed interactive hour long keynote address customized for your school, organization, or church group followed by two hours of work shopping will get students from elementary through high school writing their first scenes in minutes. The program includes Bryan's original reproducibles for teachers to use in their classrooms. Rates start at $300 for a half day, plus travel expenses. Aimed at schools that want to restructure or start a drama program on a shoe string budget. Bryan's full-day event is entitled "No Stage, No Props, No Costumes, No Lights, No Scripts, No Problems: How To Start a Drama Program from Scratch". After an entertaining, energy-packed interactive keynote address, Bryan will go on to teach you how to start a drama class that not only follows the new National Standards, but also gives you the tools to create your own original royalty free productions to produce as low-cost, high-return fundraisers. Included is a full semester worth of lesson plans with reproducibles and free original scenes that will allow you to teach drama anywhere! After just one day of training, you will be ready to create a new class or after school program using materials you already have available at your school site or in your community. Rates start at $500 for a full day, plus travel expenses. Attention AP teachers. Why pay thousands to attend a crowded AP English Language training far from home during your summer vacation when a one-on-one AP English Language training can come to you? Bryan Starchman has been teaching AP English Language for the past three years and 86% of his students have passed the AP exam with a 3 or higher. If you're brand new to AP English Language, you'll soon realize that there is no syllabus for this course. Bryan has put together a comprehensive course focusing on argument, rhetorical analysis, rhetorical devices, and synthesis essays. This course uses nonfiction primary sources, works of popular fiction, documentary film, advertising, and graphic arguments to prepare students for the AP English Language exam. Bryan's approach is fun, fast-paced, and ensures that students get the most out of the course while also preparing them to be successful on the exam. Bryan is available for one-on-one course instruction or for a group of teachers within a district that want to learn how to effectively teach nonfiction and argument. Rates start at $750 for a full day, plus travel expenses and materials. Cost includes one school year of one-on-one guidance and follow ups with same day e-mail responses, phone conferences, and Skype. Aimed at high school seniors preparing their personal statements for college applications. Bryan has taught personal statement writing for the UC Berkeley College Prep Camp at the Lair of the Bear in Pinecrest, California. Now you can have your own personal writing teacher to help you write an effective personal statement for any college. Working through the writing process online, through Skype, and over the phone, Bryan is accessible to anyone who wants to get an edge on the competition. You will work through the writing process from brainstorming to final draft in as little as a week with one-on-one guidance from Bryan. Bryan's students have gone on to be accepted at Duke, Harvard, Stanford, UCLA, USC, NYU, Princeton, and many other prestigious colleges. Most college applications are due by November, so it's never too early to start working on your personal statement. Rates start at $250 and include one-on-one one instruction, phone conferences, same day e-mail responses, Skype, and thorough edits/feedback throughout the writing process. "My students and their teen-aged audience LOVED IT! The interpretive freedom and creative opportunities provided by this production created an immediate bond between the performers and audience. A most memorable experience. Thank you for the opportunity!!" -- S. P., Director, Maryville (TN) H.S. "With no huge solo parts and absolutely wonderful chorus numbers, this was the perfect pick for our ability level. The dialog is crazy funny and the musical numbers are super easy to add lots of neat dance steps to. 'Just Another High School Musical' is a blast to produce and the kids loved it!!!" --J.P., Director, Osawatomie (KS) H.S. The junior class of Arlington High School had a BLAST doing this play. I've had so many compliments and the audience LOVED the humor. I heard things like 'maybe the best play ever' and 'I just loved the message it sent.' We introduced the play as a 'trip through the old photo album'...full of our favorite family memories. We used 'oldies' music as an additional layer while we made scene changes. The audience seemed to enjoy that as well. Again, I just wanted to thank you for such a GREAT play! It couldn't have been better!” – K.S., Director, Arlington (OH) H.S. 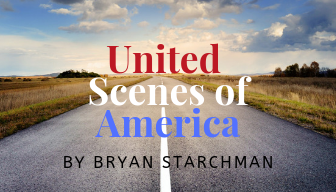 Playwright BRYAN STARCHMAN grew up in the small foothill town of Mariposa, CA., just outside of Yosemite National Park. He began writing short stories in the first grade and fell in love with screenwriting in high school. Soon he tried his hand at playwriting. At UCLA, he spent four years honing his craft. There, he won the UCLA playwriting award for his satire on fraternity life. He worked as a script reader and production assistant at FOX studios for John Davis (Predator, Courage Under Fire, Grumpy Old Men, Dr. Doolittle), Bender/Spink (The Butterfly Effect, The Ring, A History of Violence) and STARZ (Spartacus, Magic City). Unfortunately Bryan and Los Angeles went together like Elizabeth Taylor and husbands -- it just wasn’t meant to be. Now he lives in Mariposa where he teaches American Literature, Advanced Placement Language, and Theatre at his old high school. His 21 published plays have been produced over 2000 times in all 50 states and Puerto Rico, 9 out of 10 Canadian Provinces (come on Prince Edward Island!) and six more countries including Mexico, England, Italy, Dubai of the United Arab Emirates, South Africa, and Portugal. He has also collaborated with playwright and composer Stephen Murray to create the satirical "Just Another High School Musical. "· In 2015 he was the co-producer of TEDxYosemite. The event featured eight speakers including scientists, activists, and performers throughout a full day event that included hands on activities the related to the park. Participants told their own stories in a StoryCorps booth and those stories went on to be cataloged at the Library of Congress. In 2018 he was the recipient of the NBC RISE grant beating out nearly 1,000 other schools and his drama program was featured coast to coast on The Today Show.